One of the great things about CFL football is the people that you meet. In 2003 I had the pleasure of meeting Linda Wood Edwards and her husband Brian. They are fans of the Edmonton Eskimos and more importantly the CFL and they are pretty much responsible for my Grey Cup addiction. Linda is not only a great person, and fun to be around, but she’s a talented playwright who has become known through her great plays that have graced Edmonton’s Fringe Festival the last several years. 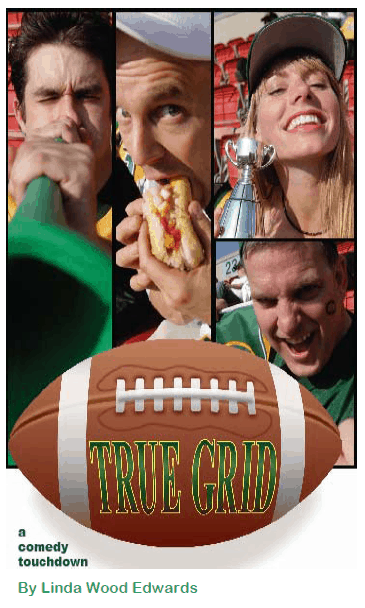 With the Grey Cup in Edmonton this year, Linda presented the idea of a new run for her popular play “True Grid”, the story of four guys x 20 football seasons = 80 years of bonding, rituals, and winning. Subtract one guy, add a lovely stranger, and risk breaking the streak. You will relate to these devoted fans as they lose and rediscover their faith during an ill-fated season. Superstitious fans of any team will love this comedy as it touches on the quirkiness of fans in regards to their teams. Linda has collected quotes and superstitions of her many football friends and experiences over the years and incorporated them into this play. In case you needed another reason to see the play, net proceeds from the production will go to support the CFL Alumni Association and the Dire Needs Fund. Wednesday November 24th at 8:00 p.m.
Thursday November 25th at 6:00 p.m.
Friday November 26th at 5:00 p.m.
For full show information here is a PDF file of the promotional poster. The show is also looking for supporting sponsors and volunteers, so if you can help in that area,here is the sponsorhip information, also in PDF format. Do yourself a favour and see this play if you’re going to Grey Cup in Edmonton!